The leading Japanese artist returns to the Onassis Stegi with an installation which challenges the limits of human perception and digital technology. How many patterns lie hidden in the universe around us and how many do we have deep within us? How random, ultimately, are the things we consider random? 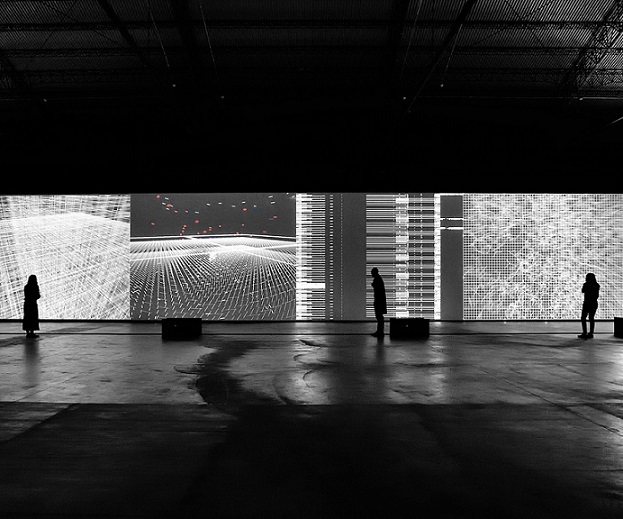 The latest work in Ryoji Ikeda’s “datamatics” series is a torrent of digits and data, a rift in the viewer's time and space. Internationally acclaimed for his digital art audio-visual installations, Ryoji Ikeda knows how to electrify the human senses. In a dark and silent environment, pulses of light and sound set the body vibrating with new data every second: the geographical coordinates of our solar system, space-time sequences, genetic codes, molecular information, numbers, lines, letters. With the precision of a metronome, twelve parallel video projectors synchronize with a minimalist electronic composition, turning numbers and data into the ultimate sensory experience for the visitor. From the micro-patterns that exist around us to the codified knowledge of the whole world, “data.flux [12 XGA version]”, the recent multimedia addition to Ryoji Ikeda's “datamatics” project-in-progress, uses the language and aesthetic of mathematics to compose countless sequential frames and pose experiential questions to the public about existence and transcendent identity. Opening party on Monday 28 January at 20:00. The installation includes high-speed video sequences, stroboscopic projections and high frequency audio fluctuations.